MoU signing of DBAR in Bangkok. A focus on education and research in Earth Data Analytics will be the cornerstone of AITs’ participation in the recently inaugurated Digital Belt and Road International Center of Excellence (DBAR ICoE-Bangkok). The Asian Institute of Technology (AIT) is one of the four core partner institutions in the project which includes National Research Council of Thailand (NRCT), Geo-Informatics and Space Technology Development Agency (GISTDA), and Ramkhamhaeng University Center of Regional Climate Change and Renewable Energy (RU-CORE). NRCT will serve as the administrative office. “Through its multidisciplinary approach, AIT will develop need-based curricula for regional capacity development and outreach activities,” says Prof. Voratas Kachitvichyanukul, Dean, School of Engineering and Technology (SET), AIT. This could include offering a Master’s degree program in Remote Sensing and Geographical Information Systems with specialization in Big Earth data analytics. AIT will also initiate interdisciplinary research projects for both Master’s and Doctoral students, as well as offer short-term training in data science and big earth analytics that is tailored towards the region. Prof. Voratas, who represented AIT at the launch of the DBAR ICoE in Bangkok added that another AIT contribution could be development of online lifelong learning resources for professionals interested in data science and big Earth data analytics. 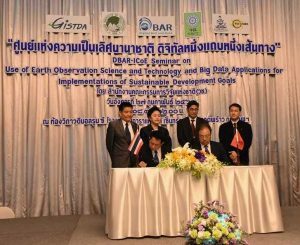 He also presented AIT at a seminar on “DBAR-ICoE Seminar on Use of Earth Observation Science and Technology and Big Data Applications for Implementation of Sustainable Development Goals” organized in Bangkok on 27 February 2018. 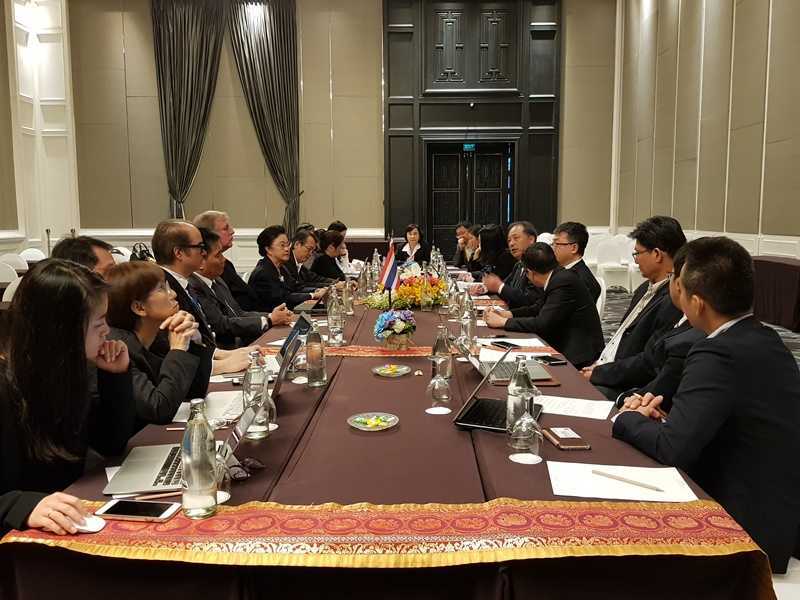 The Center of Excellence was inaugurated in Thailand following the signing of a Memorandum of Understanding (MoU) between the Institute of Remote Sensing and Digital Earth (RADI), Chinese Academy of Sciences; and the National Research Council of Thailand (NRCT). NRCT Secretary-General Sirirurg Songsivilai, signed the agreement with Guo Huodong, Chairman of the DBAR program. RADI is the administrative agency for implementation of DBAR under the Silk Road Economic Belt and the 21-Century Maritime Silk Road (Belt and Road) initiative, while DBAR ICoE-Bangkok shall serve as the regional secretariat for RADI, with NRCT as the Center administrator. Eight such centres are being established all over the world. The center will also create a satellite database for environmental protection, risk reduction, food stability, urban development, and the preservation of coastal resources and world heritage sites. Prior to the agreement signing, DBAR officials visited AIT and interacted with senior AIT officials, and acquainted themselves with various academic and research offerings. It was also decided that AIT will organize a workshop with the support of DBAR to identify the research priorities for Southeast Asia, and develop a curriculum development plan and identify potential inputs. AIT will also encourage the researchers and faculty members to approach DBAR working groups so as to identify further joint research opportunities.